Collector MRM Rao at a programme at Rajeev Gandhi auditorium in Nizamabad on Sunday. 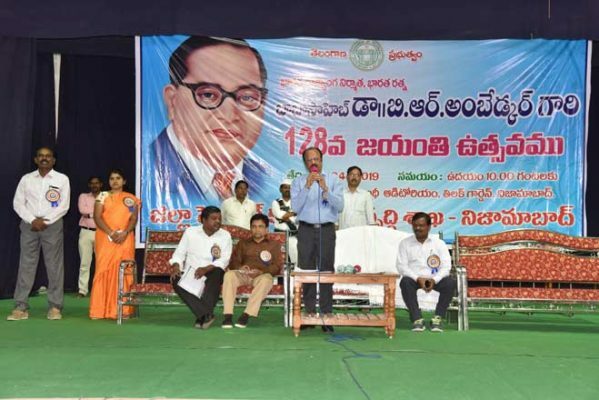 Nizamabad: Dr BR Ambedkar paved the way for equality and brotherhood in India, and we should fulfil his dreams, said Nizamabad Collector M Rammohan Rao. Collector Rao paid floral tributes to Dr BR Ambedkar statue at Phulong circle of Nizamabad city and later participated in celebrations held at Rajeev Gandhi auditorium. Rao said Dr Ambedkar wrote the Constitution keeping in mind the downtrodden communities. He said Dr Ambedkar faced many problems in his life but he kept fighting for the downtrodden communities. Collector appealed to people to utilise various government schemes being extended by the State government. SC youth should improve their skill through skill development programs and utilise loans being extended for setting up of industries, he said. Nizamabad RDO Venkateshwarlu, Social welfare Department Deputy Director Syed Sabeel, SC Corporation ED Shashi Kala, ASWO Bhoomaiah, Dalit organisation representatives Bangaru Sailoor, Gangaram participated in the programme.